This effect fills the area inside a path with a squiggly line that simulates quick, hand-drawn shading. Shapes are automatically converted to paths. Note: the squiggly line is constructed like a calligraphic stroke, that is by two almost parallel lines. This allows for variations in line thickness. You may get better results by adding a Fill and removing the Stroke (not automatically done by the effect). Warning: this effect appears to make heavy demands on the CPU. There are a great many options to control the way the hatches are drawn. The spacing, direction, and amount of bend are determined by on-canvas nodes, visible when the Node Tool is in use. The other options are controlled in the Path Effect Editor dialog. Many of the options have a random factor. One can “re-roll the dice” by clicking on the randomize ( ) icon. Definition of the nodes used to control the spacing, direction, and amount of bend of the hatches. The circle nodes are reference points. The distance and direction the diamond nodes are displaced from the circle nodes determines the applicable parameters. Left: Default hatching for the shown rectangle. Middle: After adjusting the Bend diamond node. Right: After adjusting the spacing and direction diamond node. Frequency randomness: Variation of distance between hatches in percent. Growth: The change in spacing between wiggles from right to left. The last wiggle will be about a factor of the Growth term times wider than the first wiggle. Bend hatches: Determines is the hatches should be bent. Magnitude jitter: 1st side: Magnitude of randomness of hatch bottom extents (in pixels). Magnitude jitter: 2nd side: Magnitude of randomness of hatch top extents (in pixels). Parallelism jitter: 1st side: Magnitude of randomness of hatch bottom positions left to right (in pixels). Parallelism jitter: 2nd side: Magnitude of randomness of hatch top positions left to right (in pixels). Half turns smoothness: 1st side, in: How straight or curved are the right side of the hatch bottoms (zero is straight). Half turns smoothness: 1st side, out: How straight or curved are the left side of the hatch bottoms (zero is straight). Half turns smoothness: 2nd side, in: How straight or curved are the left side of the hatch tops (zero is straight). Half turns smoothness: 2nd side, out: How straight or curved are the right side of the hatch tops (zero is straight). Variance: 1st side: Variation in how curved are the hatch bottoms. Variance: 2nd side: Variation in how curved are the hatch tops. Generate thick/thin path: Should the path vary in thickness? Thickness: from 2nd to 1st side: The horizontal thickness of the hatch going from top to bottom (in pixels). Thickness: from 1st to 2nd side: The horizontal thickness of the hatch going from bottom to top (in pixels). Demonstration of the different Hatches effect parameters. Except as noted, all options are removed or set to their neutral values. 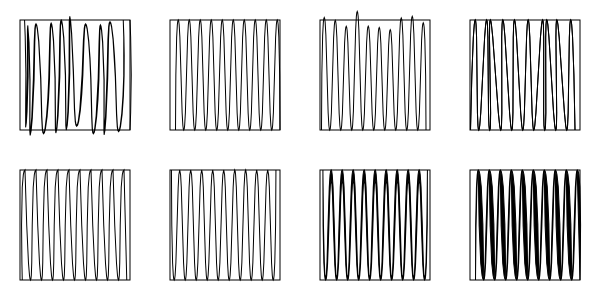 Top row, from left to right: Default settings; All options/setting removed; Magnitude jitter: 2nd side set to 20; Parallelism jitter: 2nd side set to 10. Bottom row, from left to right: Half turns smoothness 2nd side: in set to 0, out set to 2; Variance 2nd side set to 10 (BUG? Doesn't seem to do anything. ); Thickness: at 2nd side set to 10. Thickness: from 1st to 2nd side set to 5.